Bayside’s elected Council removed concrete Bayside’s Commissioners laid on the foreshore. Click on the menu of Main Pages here or on a blue hyperlink below. The photograph above shows the easternmost end, at Cromer Rd, Beaumaris, of the concrete bicycle road built by the unelected Bayside City Council commissioners in the mid 1990s. 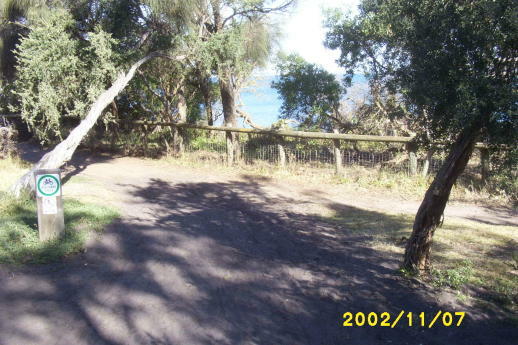 That end intruded into the Beaumaris foreshore reserve nearly up to the edge of the Beaumaris Cliff, leading to concerns that it might be continued on to Charman Rd, and replace the longstanding sandy walking track through the bush. The photograph above shows the part of the Beaumaris foreshore reserve, at Cromer Rd, Beaumaris, in the photograph at left. This was soon after the easternmost end of the concrete bicycle road that Bayside City Council’s unelected commissioners built in the early 1990s, shown in the photo at left, was removed in late 2002 by Bayside’s first elected Council. 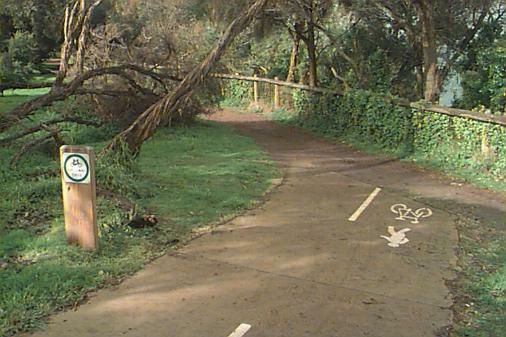 The removal restored the end of the popular sandy walking track from Charman Rd to Cromer Rd.